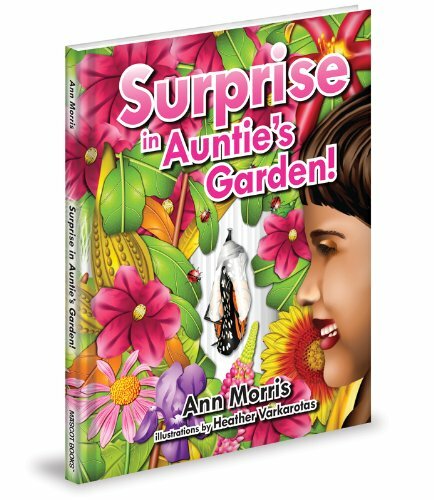 “Surprise in Auntie’s Garden” is a story with two characters, Erin and Auntie, who share their love for flowers and like to spend a lot of time together in Auntie’s garden. Erin, as any curious child, is very interested in finding out all about “Mr. Clown” and the plants where she found it, so Auntie teaches her about the plants. She also looks up on the Internet some information about “Mr. Clown,” and she even finds out what kind of caterpillar Mr. Clown is. A wonderful moment in the book is when Erin and Auntie have the opportunity to live along with Mr. Clown its beautiful transformation! This is a book that can be read before of after “Amazing Matilda” by Bette A. Stevens, a book that talks about the same issue, from a different point of view. Ann Morris gives us again an easy-to-read book. The story, based in her own experiences as a parent, made me think about all the opportunities we have every day to encourage our children to learn and respect the nature. The illustrations by Heather Varkarotas complement the story in a really nice and colorful way. This is definitely a good option to read with your little ones. “Surprise in Auntie’s Garden” es una historia con dos personajes: Erin y Auntie, quienes compraten su amor por las flores y a quienes les gusta pasar mucho tiempo en el jardín de Auntie. Erin, como cualquier niña curiosa, está muy interesada en aprender todo acerca de Mr. Clown y las plantas donde lo encontró, así que Auntie le empieza a enseñar. También buscan en Internet información acerca de Mr. Clown e incluso descubren de que tipo de gusano se trata. ¡Un hermoso momento en el libro es cuando Erin y Auntie tienen la oportunidad de vivir junto con Mr. Clown su bella transformación! Este es un libro que puede leerse antes o después de “Amazing Matilda” de Bette A. Stevens, que trata el mismo tema desde otro punto de vista. Ann Morris nos da otra vez un libro fácil de leer. La historia, basada en sus propias experiencias como madre, me hizo pensar en todas las oportunidades que tenemos todos los días para fomentar en nuestros hijos el aprendizaje y el respeto a la naturaleza. Las ilustraciones hechas por Heather Varkarotas complementan la historia de una manera bella y colorida. Definitivamente una muy Buena opción para leerles a los pequeños. This entry was posted in Children books and tagged Ann Morris, Children books on October 26, 2013 by Jose Luis Cortes.